Butterbean :: Healthy sunscreen for little sprouts. 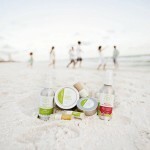 Also offering all natural insect repellent and organic lip balms! Sqrl & Bee Studio :: One of a kind, handmade creations using natural materials such as wool, silk, cotton and glass. I truly appreciate the support of both my sponsors and readers. Thank you! If you are interested in sponsorship, please email me!